The week beforehand was pretty rough, storms blanketed much of Sydney for days. By the weekend the weather was brilliant, warm days and cool nights. We paid for the weather though. The cold water Making its way down the river and cool conditions had the fish pretty well shutdown. Made it difficult for novices like me. In fact, I got a donut. My son Daniel though, did catch two fish, small, but out fished his old man. There were fish caught, but by any measure the fishing was tough. 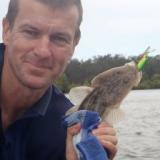 Some of the guys floated down to Yellowmundi from Penrith and caught a few fish. We fished with Rico on the Saturday afternoon and he caught a nice fish of around 30cm after persisting on the one fallen tree. Despite the absence of fish, it was a great weekend. We had a great time fishing together. Daniel and I took turns at paddling, and he learnt to cast right hand and reel left handed. He also caught his two fish, got some lures in nice and close to cover and worked out how to flip a lure out of a tree! The venue was perfect. Easy access to the river to get yaks in, and a great campsite. Best of all we had a fire and a great undercover picnic area with tables. Big thanks go to the landcare group at the Yellomundee regional park for allowing us to use the site and for Tham, Gary, Al and all the others for making it a great weekend. Looking forward to the next Bass Catch already.